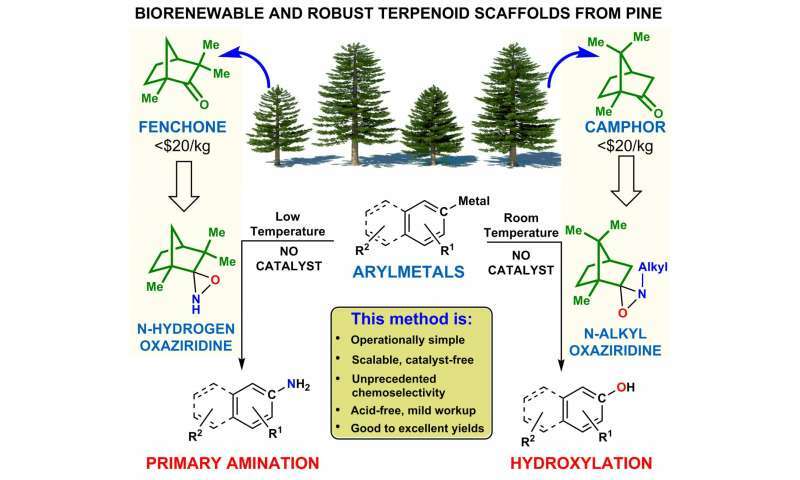 The goop from pine trees that contains compounds known as terpenes is used in the manufacture of food, cosmetics and drugs, but it might become even more valuable as a chemical reagent made through a process developed by scientists at Rice University. Amination introduces amino groups into organic molecules to create amines, compounds with one or more nitrogen atoms that are essential to metabolic processes. Hydroxylation incorporates oxygen-hydrogen (hydroxyl) groups into organic compounds to create alcohols or phenols. Reagents prompt or report on chemical reactions when added to a system. The lab's process allows for the rapid synthesis of nitrogen- and oxygen-containing molecules by using terpenoid-derived reagents at or below room temperature and in one step. 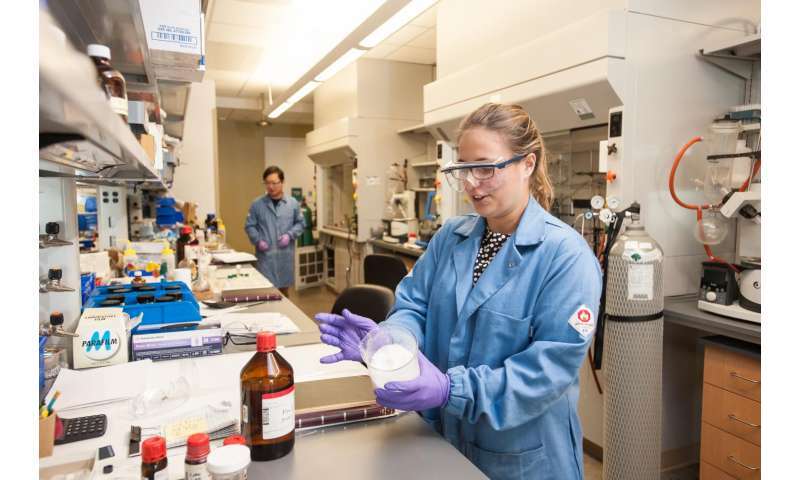 These multifunctional reagents facilitate the easy transfer of oxygen and nitrogen atoms during the synthesis of a wide range of compounds and can be recycled and reused, which cuts waste and saves money for manufacturers, Kürti said. The work is the subject of a paper this week in Nature Chemistry. "Terpenoids like camphor and fenchone are abundant and biorenewable natural products," said Kürti, an associate professor of chemistry at Rice. "I'm excited about their use as robust reagent scaffolds because these are about as cheap as they get." The new, biorenewable reagent scaffold is a middleman that allows the transfer of either nitrogen or oxygen from one molecule to another. Most reagents are used only once and discarded. The Rice researchers sought a better way to incorporate nitrogen and oxygen atoms into sometimes-delicate molecules and in the process discovered a single scaffold that could be used for the transfer of either oxygen or nitrogen. "A long time ago, people realized it would be nice if we could have a one-step conversion of negatively charged carbons (i.e., carbanions such as those found in arylmetals) into primary amines that now contain a new carbon-nitrogen bond," he said. "This is difficult because the nitrogen-hydrogen bonds in traditional aminating agents are very acidic and rapidly destroy the delicate carbanions." The researchers discovered that aminating agents with bulky terpenoid scaffolds can effectively shield the nitrogen-hydrogen bond while still exposing the nitrogen to contact with the arylmetal, he said. "We demonstrated that camphor and fenchone-derived bulky nitrogen-hydrogen oxaziridines (triangular molecules in which oxygen, nitrogen and carbon atoms are interconnected) transfer the nitrogen atom exclusively to arylmetals, while nitrogen-alkyl oxaziridines transfer the oxygen atom exclusively. "Given that the oxaziridines are oxidizing agents, it was remarkable to see otherwise easily oxidized functionalities like thioethers, tertiary amines and conjugated double bonds survive the heteroatom-transfer process intact," Kürti said. He said that all of the terpene-derived oxaziridines are stable at room temperature. "We can keep it on the bench indefinitely and nothing happens to it," Kürti said. "The previous processes were less practical since they relied on highly reactive—thus unstable—aminating agents that required storage at low temperatures. "Oxygen and nitrogen are exceedingly important heteroatoms," he said. "So using the same biorenewable terpenoid scaffold and making just a very minor structural change to transfer one or the other heteroatom is huge. It's stable, it doesn't decompose, it doesn't use transition metals and you don't need expensive ligands. That's why it's so cool."